All hail the baked potato. This inexpensive, simple, family-friendly staple makes a great side dish or main event, depending how you top it. 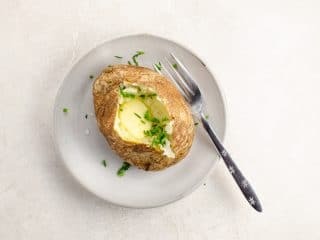 Here's how to bake a potato perfectly every time, with tips for starting a baked potato in the microwave if you're short on time, and how to accommodate the oven temperature of whatever else you might be cooking. 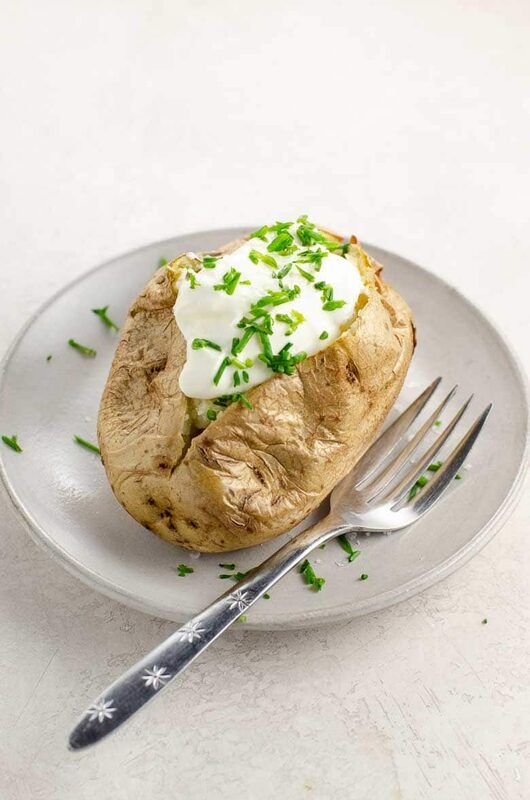 Bonus points if you adopt the adorable English name "jacket potato" and serve it as the only vegetarian school lunch option literally every day of the year, but we'll love ya even if you don't. We prefer to bake potatoes at 400°F when possible, but they're super-accommodating if you've got something else in the oven. See below for cooking times. This is an easy one. 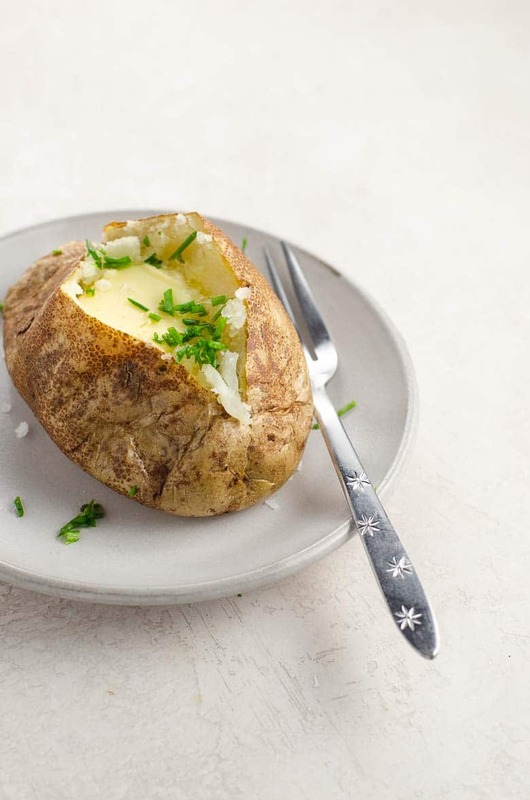 We happily traffic in all kinds of potatoes, but for baked potatoes we always use russets (also called Idaho). Their skin crisps really well, and their flesh bakes up fluffy and tender. A quick note: potatoes are part of the "dirty dozen," meaning conventionally grown potatoes tend to have a very high pesticide concentration. Since you don't peel baked potatoes, it's a good idea to buy organic potatoes if you can. Preheat oven to 400°F (or see chart below for other oven temperature and time combos. Place a rack in the center of the oven (this is where your potatoes will go) and a rack at the bottom with a rimmed baking sheet to catch any drips. Baking potatoes straight on the oven rack is the best way to ensure crisp skin and even cooking all around. Scrub potatoes clean and dry them well. Poke shallow holes all around each potato with the tines of a fork to let some steam escape during baking. Rub each potato with a little bit of oil and sprinkle with salt. This helps crisp the skins, makes salt stick easily, and "magically" (i.e. scientifically) regulate the moisture inside the potatoes as the cook. Place potatoes directly onto middle oven rack and bake until very tender throughout. Baking time will vary with the size of your potatoes, but should be around an hour for medium-sized potatoes. Potatoes are done when they yield easily to a fork or give readily when you squeeze them. If you're short on time and making one to four potatoes, starting baked potatoes in the microwave is a useful hack. Preheat oven to 450°F. Place a rack in the center and a rack at the bottom with a rimmed baking sheet to catch any drips. Scrub potatoes clean and dry them well. Poke shallow holes all around each potato with the tines of a fork to let some steam escape during cooking. Place potatoes in microwave. For 1-2 potatoes, cook on high for 6 minutes. For 3-4 potatoes, cook on high for 12 minutes. Carefully rub each hot potato with a little bit of oil and sprinkle with salt. Place potatoes directly onto middle oven rack and back until crisp outside and very tender inside, about 20 minutes depending on size. How long to bake a potato depends on both oven temperature and potato size. Here's a general guideline for medium-sized russet potatoes based on oven temperature. 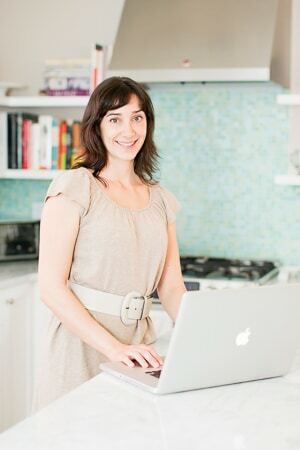 It's better to cook your baked potatoes slightly longer than slightly too short. Baked potatoes are hard to overcook terribly, and no one wants a crunchy center. The sky's the limit here, my friend. For a classic side dish, a generous amount of good salted butter or sour cream, a sprinkle of flaky sea salt and freshly ground black pepper, and some minced chives add up to sheer, simple perfection. 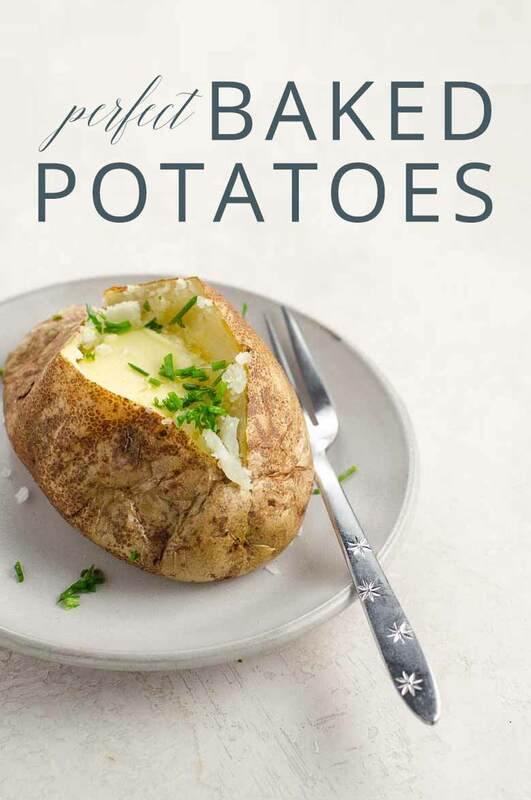 Baked potatoes are so fabulously versatile. They make an equally good side dish dressed simply with butter or sour cream and chives or main dish topped with practically anything you like. We prefer cooking them in the oven from start to finish, but if you don't have the time, you can start them in the microwave and finish them in the oven, too. Preheat oven to 400°F. Place a rack in the center and a rack at the bottom with a rimmed baking sheet to catch any drips. Rub each potato with a little bit of oil and sprinkle with salt. Cut a slit lengthwise across the middle 2/3 of each potato. Squeeze potato in and up from both ends. Top with butter or sour cream, chopped chives, and a sprinkle of flaky sea salt — or whatever you like. The sky's the limit.